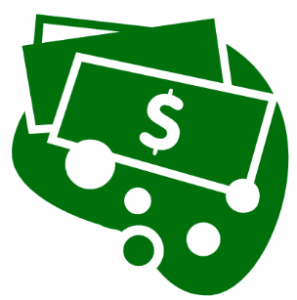 For only $58.00 per year you can access all of the videos and tutorials of geeksontour.com PLUS access our online question and answer forum and the show notes for What Does This Button Do? Your Paypal account will be automatically billed each year until cancelled. Don't have a Paypal account? If you have an email address and a credit card, the Paypal account will be created for you. 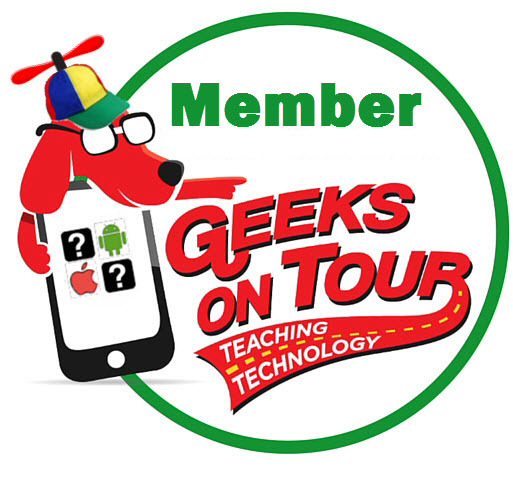 Membership also includes 7 eBooks, including Mrs. Geek's Guide to Google Photos. For only $68.00 for one year you can access all of the videos and tutorials of geeksontour.com PLUS access our online question and answer forum and the show notes for What Does This Button Do? Membership also includes 7 eBooks, including Mrs. Geek's Guide to Google Photos. Includes all of our videos (over 400 - about 35 hours) on all of the topics we offer. Also includes 100 Button Show notes, and 5 eBooks. 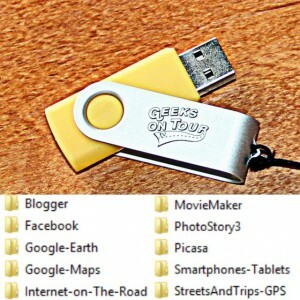 Just plug it into the USB port of any Windows or Macintosh computer (or plug into a travel router accessible by mobile devices) and you will see a folder for each topic. Open the folder and you'll see all the videos. The videos are standard .mp4 files and the documents are standard .pdf files. 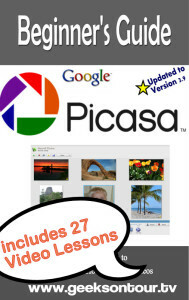 The .pdf version of our popular guide to using PIcasa. This is a small book, 66 pages that you can print yourself. Read all the way thru it in just a couple sittings to get an overview, or spend time with step by step exercises as well as watching the video lessons to gain in-depth understanding of managing your digital photos with this free software from Google. Note: this eBook is included in the USB drive above. If we happen to be nearby, you can schedule a session with either Chris or Jim. If not, we can set up remote sessions over the Internet where we can see your screen. Use our Contact Us page to schedule your session. Minimum 1 hour. This is for paying an invoice or other agreed amount. Just fill in the amount in the blank below, then click Add to Cart. You don't need to have a PayPal account, you can use Visa, Mastercard, American Express or Discover and PayPal will securely process the transaction. The credit card options are below the PayPal options after you click on this button - just scroll down. Read more information about PayPal's security We believe that PayPal is more secure than sending a check in the mail. But, if you must send a check, please make it payable to Geeks on Tour. 411 Walnut Street #4816 Green Cove Springs, FL 32043 THANK YOU!